Big snowflakes were associated with a total changeover from rain to snow about 2:30 p.m. Thursday, Feburuary 23, 3012 — snow that started falling ahead of forecast. Rain has turned to all snow at about 2:30 p.m. in Arlington Heights as the air temperature has dropped from 39.0°F at 12:52 p.m. to 34°F at 2:52 p.m. at Chicago Executive Airport. Snow is accumulating on grass and pavement surfaces. Minor car crashes have already increased ahead of rush hour, and Rolling Meadows Police Department already switched to the Emergency Accident Plan, which requests crash victims with drivable vehicles and no injuries report crashes at the police station. 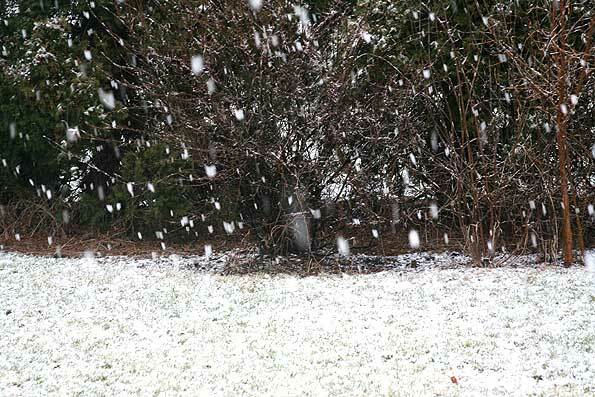 Snowfall is occurring ahead of the forecast for the expected rain change to snow. We could be in the wort-case scenario for snowfall. 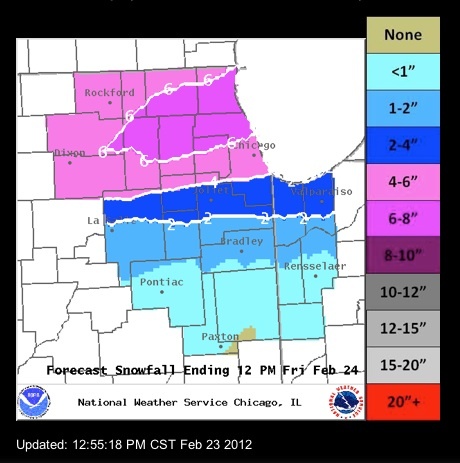 The deepest snowfall is directly on the northwest suburbs of northwest Cook County and the northern third of Cook County; and including the northern two-thirds of Kane County, the southern half of McHenry County and more than three-fourths of southern Lake County. Thundersnow is still possible with embedded thunderstorm during snowfall. NWS Forecast Snowfall Ending 12 PM Friday Feb. 24, 2012.